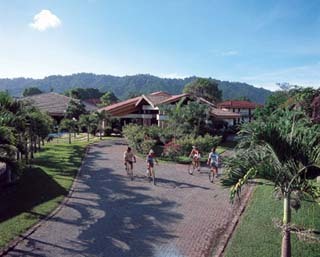 The Hotel Barcelo Amapola is an all year 4-Star Resort located in a town of great tourist attractions in Jaco, Costa Rica. This is a perfect destination for those who love surfing, nature trails, horseback riding and luxury accommodations. 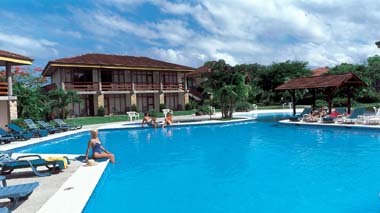 This beautiful hotel offers you the "All Inclusive Program," in a style that only Barcelo knows to give you. There are numerous restaurants, night life and entertainment centers - besides being located on one of the most desirable beaches for surfing. The luxury guest rooms include two double beds, cable TV, safe deposit box, air conditioning and direct telephone line. The guest suites include a living room with a sofa bed, cable TV, mini-bar, bedroom with king-size bed, safe deposit box, direct telephone line and air conditioned. The guest villas include a living room, dining room, fully equipped kitchen, two bedrooms, cable TV, direct telephone line, air conditioning, daily maid service, hair dryer and patio/balcony. Services in the "All Inclusive Program" includes: "Ginger" Buffet Restaurant, grill on pool side, disco "Amapola", wet bar, Jacuzzis, bicycles, and parking. Additional services available are laundry, local and international phone calls, taxi service, internet access, audio-visual equipment, conference and events rooms, excursions, bottled mineral water, sun beds next to swimming pool, pool towel changes, horse rides, room service and the Casino. If you are looking for active holidays, a relaxing atmosphere, full of amusement and fun within a truly vocational spirit, Barcelo Hotels opens the doors to an amazing world created to match your needs. Jogging, aerobics, aqua-gym, volleyball, archery, tennis, squash, mini-golf, boules, shuffleboard, ayaks, rafting, windsurfing, snorkeling, pool and beach games, handicraft workshops, painting on T-shirts, nature walks, billiards, theme nights, competitions and shows. The resort is open all year, consists of 44 standard rooms, 6 suites, 3 villas and is 2 hours by road to San Jose. 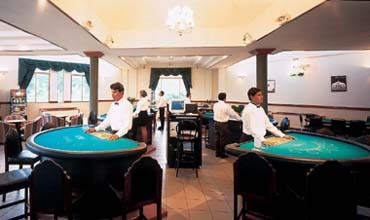 The resort is surrounded with a garden of vegetation and tropical trees and has been open since 1995. No better place to hold that special conference, seminar or meeting for your staff and/or clients. The atmosphere is productive to quiet concentration with luxury up to the moment service and amenities.